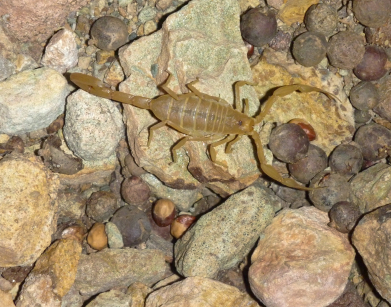 Arizona Bark Scorpions are considered the most venomous scorpions in North America, with the number of Bark scorpion sting victims in Arizona alone estimated to be in the thousands each year. These scorpions measure an inch to inch and a half in length, and are a pale yellow in color. The Striped Bark Scorpion is the most widespread scorpion in the United States. The scorpion is a smaller species of scorpion, measuring a total body length of 1 to 1.5 inches. This species has a powerful sting, which often results in pain comparable to that of a wasp; that can last for several hours. They are distinguished by their orangish brown color, and the black striped that run vertically down its back. 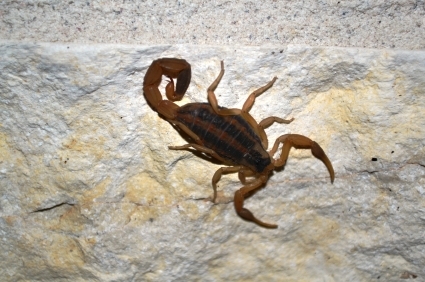 The Striped-Tailed Scorpion is sometimes referred to as the Arizona devil scorpion or Wood scorpion. These scorpions measure about two inches in length, are a tan to dark brown in color, and are a little thicker or stockier than the bark scorpions. They infest homes in Arizona, California, New Mexico, and Mexico. *** Note *** Desert Hairy scorpions are also commonly found in the Southwestern U.S., but these scorpions rarely infest homes to the extent of the above mentioned.